Capture perfect action dog photographs, even if they won’t sit still for more than five seconds! With all that pent up energy it can be hard to get a good snap of the dog on your smartphone with only wisps of hair and blurred fur as they zoom past. 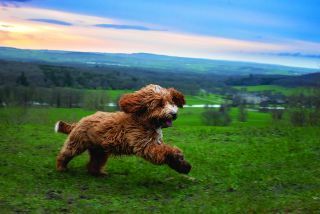 Opt instead for a DSLR and you’ll quickly see just how much more capable you are of capturing some great dog action shots as they bound through the air at full speed using our photography tips. However, it’s still difficult to balance the exposure, get focusing spot-on and compose the image in a way that pleases the eye. Let alone getting your dog model to behave well enough for your dog photography in the first place! That’s why having all your settings dialled in first, before unleashing the hairy bullet, can help improve your hit rate. Having a helping hand whilst you’re shooting is also a must if you want good shots. We photographed Rupert, a tan-brown cockapoo, during his evening walk with owners Jess and Ben. Although Rupert was only seven months old and had limitless energy, they did a good job of corralling him, aided by the temptation of snacks, to allow us the opportunity to get close photographs of him. So let’s take a look at what you need to do to get mid-action doggy portraits! The first adjustment you should make is to use Continuous High burst mode. When the shutter release button is pressed your DSLR will fire off photos for as long as you hold it down, so you can pick the best shot from the sequence. Engage Continuous autofocus (AF-C) along with Single-point AF, set to the central autofocus point, and keep this trained on the dog’s face as it runs across the frame. The camera will refocus on the animal as it comes closer to you, resulting in more in-focus shots. We shot in Manual at 1/320 sec for a fast enough speed to avoid motion blur from the running dog, and with an f/8 aperture for a decent depth of field, ensuring the Rupert’s entire body was crisp. It was getting dark, so we set ISO2000 to maintain a good exposure. Shoot from a standing position down at the dog and you’ll end up with plenty of ground, and not much else in your photographs. Crouch down – or even lie down on the ground on your belly – to get a hound’s-eye view of the world. If the light is falling, you’ll have two problems getting a balanced shot: pushing the ISO will increase noise and lower definition; widening the aperture means your dog may not be in focus. Try underexposing by a stop, to maintain the same settings, then boost exposure in post. Boring gravel pathways and dirty, messy tracks are uninspiring and distracting, so look for natural, grassy surfaces and uncluttered backdrops. Evening light really helps too – in the main shot (previous page) we can see the sunset falling over a glorious countryside vista. We asked Rupert’s owners to help by standing close by. One stood just behind, camera-right, and the other a few metres at a diagonal camera-left and encouraged him to run back and forth for treats. Rupert then ran diagonally across the frame, giving plenty of time to shoot. Try to start photographing as soon as possible when taking the dog for its walk. When dogs are let off the lead they have a habit of finding the nearest mud bath, and that can look somewhat less attractive in a photograph than a clean, neat pooch. It’s important to don the relevant attire for an outdoor shoot. A suit or smart dress might be appropriate for shooting a wedding, but when there are excited dogs, with dirt and fur all around, it’s better to opt for waterproof clothing, particularly if laying on the ground. Provide plenty of positive feedback to the dog when they do something right. Pats or treats are great ways of encouraging your furry friend to perform the correct way. Make sure you give them breaks in between bouts of shooting, otherwise they might overheat.